During a trip to Ontario, Canada, I had the opportunity to learn from Caleb Musgrave of Canadian Bushcraft and Brothers of Bushcraft. During our trip to the beautiful Canadian wilderness we worked on several projects including building Mors Kochanski's Super Shelter. This shelter is designed to be a lightweight, dry and warm. By using the laws of physics we are able to create a warm environment to help get is through the night and dry our gear. Mors Kochanski is a legendary Canadian bushcraft instructor and the author of very well written books such as the book by the title of: Bushcraft: Outdoor Skills and Wilderness Survival. Mr. Kochanski is an inspirational instructor, and a woodsman innovator. Any time you see someone who has dedicated their life to the art of bushcraft and woodsmanship it is something to be respected. My dear friend Caleb Musgrave has also dedicated his life to learning and teaching the ways of his people past and present bushcraft skills. Now lets talk about this great shelter. The knowledge learned from this shelter can be applied in many forms. If built properly it will ensure much warmer nights in the woods and could possibly save a life. While we can say there is no perfect shelter for every situation, we can also say the super shelter is an impressive runner for first place. 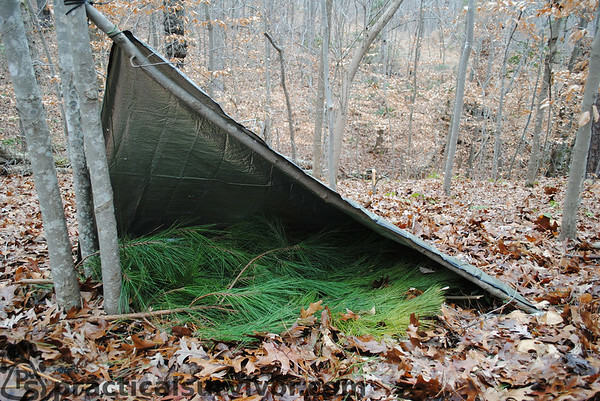 The idea Mors used was based on the concepts of what a shelter should provide to a person in the cold environment of the boreal forest. He used the concepts of thermal radiation, to create a shelter that will provide heat, comfort and a way to dry your clothes. In short, we use the radiation from a fire, the reflection from a fire wall and the mylar and well throw in some refraction as it passes through the clear plastic medium. This of course makes the super shelter dependent of a heat source. 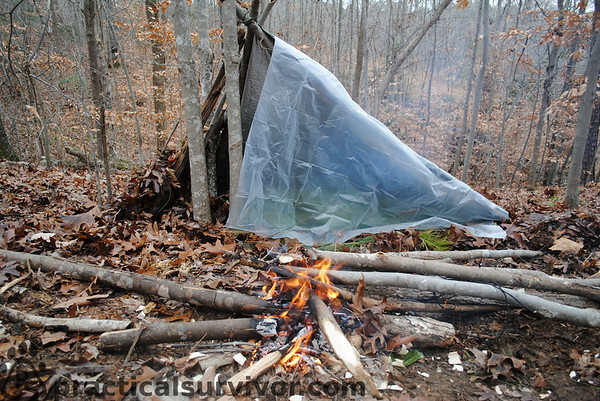 Debris shelters help us stay warm with the use of insulation. In North Carolina the ground is not often covered in snow for months at a time so shelters built of leaves can be put together and if properly built keep us warm. In the northern region pretty much everything will be covered in ice and snow. Skills such as proper axe use and fire starting become even more crucial to survival. While there are more permanent structures a person could build to provide the same level of comfort, what Mors Kochanski did was design a lightweight shelter that would maximize the comforts of a more intricate and time consuming shelter. You are probably thinking, get on with it already, how do we build this super shelter you speak of? What do we need to build a super shelter? Note: The links provided are just some samples of items that can be used. Do your research and make sure you are purchasing the item that best fits your situation. Note: In Kochanski's super shelter book he also suggest carrying duct tape and safety pins for tying down the shelter. 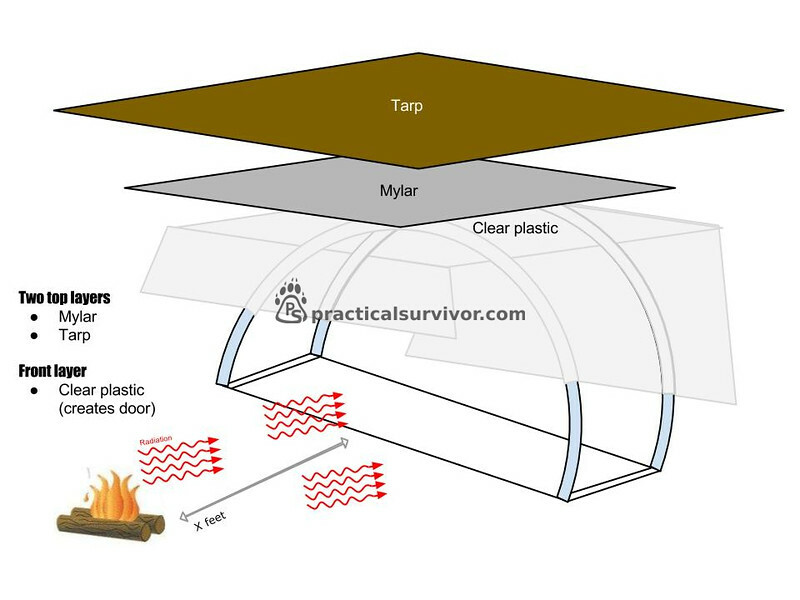 The logic is to allow the radiation to pass through the clear plastic medium and enter the shelter. At that point the mylar blanket will reflect the heat back into the bed area. 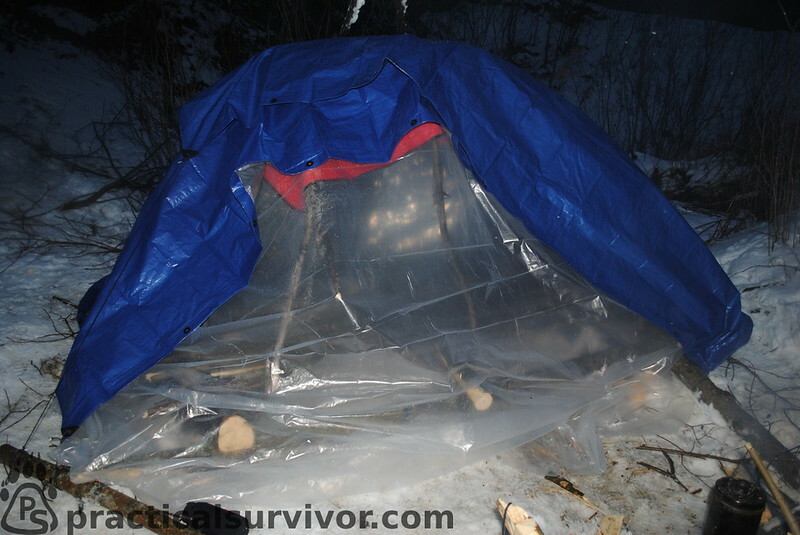 By using multiple layers (tarp, mylar sheet, we trap air between the layers similar to a tepee design. The reflective properties of the mylar emergency blanket are key to the effectiveness of the super shelter. The highly reflective qualities of the material is what makes it so attractive to anyone thinking about backpacking, hunting, and emergency preparedness. Hunting clothes such as Columbia's Omni Heat Jackets were designed with the same concept, the inner liner of the jacket is supposed to reflect the heat back onto the person wearing it allowing for much lighter layers while still keeping warm. Hopefully we can test the jacket and write a review. There is one drawback to mylar and that is less permeable to air molecules but also moisture. The same reason why a mylar balloon will keep helium longer than a rubber balloon, it will become a vapor barrier trapping moisture inside. This is why wrapping a person with a mylar blanket is a very short temporary fix if trying to keep warm. Unless properly used, the body created moisture will eventually make the person wet and cold. But that is something we will cover in another article. What is important for this article is mylar's ability to reflect heat back onto the person/s in the super shelter. What are all the ways we lose heat? Radiation The process of heat moving away from the body. The human body radiates heat constantly. Conduction Heat loss by direct contact with a colder surface. In the colder environment keeping warm becomes a combination of the proper clothing and shelter. We increase our chances of keeping warm by minimizing the heat loss caused by evaporation. Properly remove the moisture the body lets out by using a wicking layer and drying our clothes over night. Mitigate heat loss by radiation or trap the radiative heat inside our clothing or shelter. Avoid direct contact with a colder surface especially while sleeping. Finally protect the body from the moving colder air. Radiant heating, that warm feeling we get when near a fire. Thermal radiation is defined as electromagnetic radiation generated by the thermal motion of charged particles in matter. All matter with a temperature greater than absolute zero emits thermal radiation. What we need for the shelter is the thermal heating caused by the infrared waves going into our shelter. While infrared is light we cannot see (our eyes only see visible light), we deal with infrared on a daily basis. Feel the warmth emitted from a brick wall as the sun goes down, or perhaps a piece of coal from your fire no longer emits light yet we can feel its warmth for hours. Sunlight is part of thermal radiation generated by the hot plasma of the Sun. The Earth also emits thermal radiation, but at a much lower intensity and different spectral distribution (infrared rather than visible) because it is cooler. Source With the super shelter we will use the radiative waves, bend them, and reflect them all for the final goal of a warm sanctuary. While light tends to travel in a straight line, it will sometimes change direction as it goes through a medium. In this instance the plastic is the refractive medium which causes the propagation of radiation inside the shelter. Once inside the shelter the radiative waves will then reflect. As the radiation enters past the clear plastic the mylar will reflect the heat back onto other areas of the shelter. It is through this process that we create a warm bubble inside of the shelter. This heat not only adds life saving comfort to the shelter but also helps with the task of drying our clothes. The longer we are in the cold wilderness, the more waterlogged our gear can become lessening the insulating effects of the layers. Wool offsets some of this but it can cause for a colder experience in the woods. While we could tramp around the woods and possibly scavenge the wood to build a shelter. Chances are the right size wood will not be readily obtainable so we would use an axe or saw to build the shelter. Note: This a longer term shelter, we would avoid cutting down trees unless the situation truly calls for it. Proper use of an axe is a bushcraft skill that is extremely important. If an axe is not handled safely, we could find ourselves deep in the woods with a life threatening injury. A good quality axe such as a Gransfor Bruks is crucial. This is not one of those tools you want to cut cost on. Do your research and make sure the tool is up for the job. Next there is the subject of axe safety. We are always mindful of some basic rules of axe safety: keep it sharp!, be aware of where the axe would go if the blade bounces, learn proper swing methods, lower is better (stay low to the ground if possible) if the axe does bounce it will likely hit the dirt rather than our leg, we watch our surroundings, mind our swing perimeter (clear an axe yard): making sure we do not hit a limb or someone close to us while swinging, proper axe storage, carry a first aid kit with the appropriate items, did we mention keep it sharp? Caleb was very detailed teaching proper handling of the axe while felling a tree and while doing other camp chores such as wood splitting and making feather sticks using an axe. Later we would find ourselves using a collapsible saw for testing purposes but also for some more detailed work. Since our shelter needed to be large enough to fit two people, we had to go with a larger tree. We were mindful to fell a tree that would give us everything we needed and made sure to use every piece. Any left over pieces could be used for a reflective fire wall. The first part was to build a square frame from the larger portions of the tree. Several wood cabin style notches were cut from the wood to help keep the frozen logs from sliding as we added other pieces. At this point we continued to add layers to the base so we can make a bed of saplings off the cold ground and let that be our cold well. A cold well is an area where the colder air in the shelter can collect hopefully below the level of your sleeping area. The first time we saw a cold well was reading about igloo and snow cave shelter building. Caleb explained that if we were unable to build the sleeping area at a higher point, we could use a trench to mimic a cold well. Since we were building the super shelter in a dome-like geometry, we would use the inside of the larger stacked wood to hold the bent saplings under pressure. From there we would interlace the saplings building a roof like supporting structure. The saplings would need to hold up to heavy winds. Snow build up should not be an issue due to the heat source keeping the shelter warm and the arch shaped roof should shed any residual hitch-hiker snow. Learning to work with wood at the temperatures typically seen in Ontario was a new experience. The wood splits differently and of course bending frozen wood is just not the same. This is again where Caleb's knowledge of proper wood choices was another important lesson to learn. Due to the aggressively fluctuating temperatures and changing levels of activity throughout the day, we removed our water proof outer layer. While kneeling down to cut the wood, our knees became water-logged. Considering the fast approaching sunset, we built a fire to help get us dry and melt snow for hydration. We wanted to maximize heat reflection and settle a bed of coals before being ambushed by the cold evening air. After taking a small break and partly drying our clothes, we moved forward with the build. At this point we split the work, a mix of intertwining the long saplings and cutting the right size pieces for a sleeping area. This is where the saw became a useful tool. The shelter was really starting to take shape, it was going from a vision in a Mors Kochanski's books to legitimate refuge from the blistering cold. Caleb used the inner strands of the parachute cord to bind the saplings for the roof in place. While the super shelter structure can be built in different configurations, we built a Quonset semi circular shape. A lean-to or some other dome shaped shelter can be built and get similar results. With the sun starting to go down, we knew we needed to move fast to finish the shelter. We finished adding saplings for the sleeping area and began to stretch the different layers. First we stretched out the mylar blankets, we extended the clear plastic over the shelter and as a final layer we stretched out the tarps/tarpaulines. 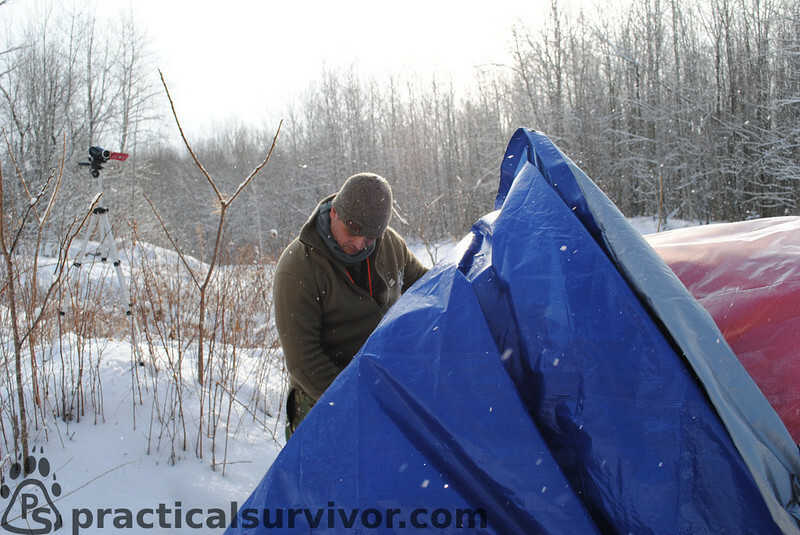 The inner area of the tarps was silver so we made sure that was facing the inside of the shelter as well. The shortened days of winter and the sun quickly dropping gave us enough to time to ensure the shelter was sealed. We added snow around the edges to help secure the tarpauline edges and prevent the wind from sneaking in during the night. Feeling very proud of our final product and feeling a sense of accomplishment, we crawled into she shelter. Using a candle for light and added warmth, we laughed and shared our thoughts of the day. With the fire crackling the temperature difference was instantly felt. Immediate alleviated from the wind chill and feeling the radiative fire come through, gives an instant sense of comfort. Humans depended on fire throughout the centuries for survival. Even today, it just takes unplugging from our daily rituals and heading to the wilderness to bring back a new sense of what is truly important. Unfortunately a previous injury came back to haunt me and limited some of my options during my time there. Even so the experiences learned have carried over during every trip to the wilderness as a guiding voice. Forever looking at the forest through different eyes, as the wolverine taunts me back into the deep woods. Beyond the knowledge these are the life changing moments that mean the most. The super shelter can be built using different frame geometry and people experiment with layers. Commonly seen in a dome-like geometry, it can also be built using a lean to. With some slight modifications, we built a raised bed to allow room for a cold well, filled the gaps with leaves and used a parallel log fire to keep us warm throughout the night. We were able to raise the temperature in the shelter 40+ degrees Fahrenheit with minimal insulation. Had they been available, we could have added hot rocks in the shelter to raise the temperature further. One of the many advantages of this shelter is the option to dry our clothes and gear. A special thank you to brother Caleb Musgrave. Not only is he a good friend but an amazing teacher. Anyone who underestimates his knowledge and woodsman wisdom would find themselves surprised. His dedication and determination is inspiring. Caleb has a true passion for bushcraft and a hunger for knowledge for the history of his people. 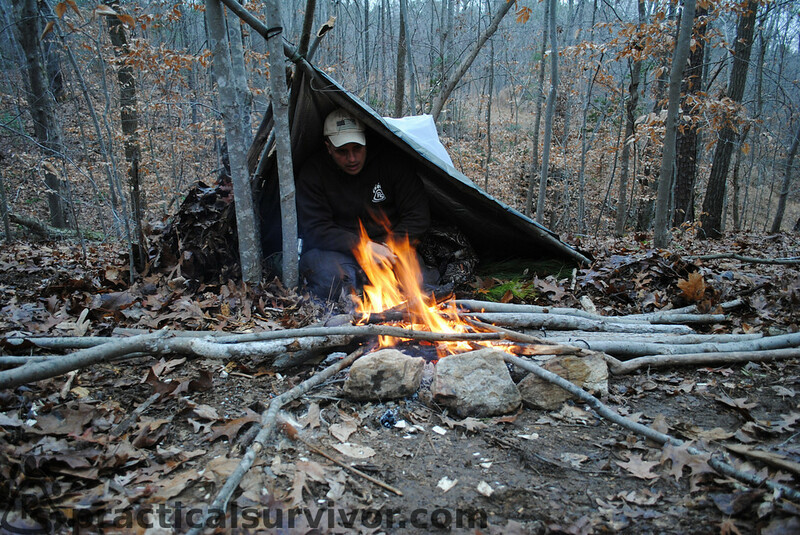 His willingness to share his wisdom is an example to other bushcraft instructors. My visit to Canada would have been nothing without his willingness to take the time to share it with me as if I was family. I wish my injury would not have limited some of my time there but it was a magical time for me. Anyone could learn more from Caleb in one week, than they could on their own in years. One thing has become obvious throughout our knowledge seeking travels, those with true bushcraft knowledge do not act in arrogance but help guide the newcomers with open arms. The true masters are confident enough in their skills that they let their expertise do the talking. Thank you brother Caleb.